Westport Country Playhouse will present a series of special events, free-of-charge and open to the community, surrounding its world-premiere drama, “Thousand Pines,” playing October 30 through November 17. Written by Matthew Greene and directed by Austin Pendleton, the production brings the national dialogue about gun violence to the Playhouse stage. Support for the community events is provided by a grant from CT Humanities. 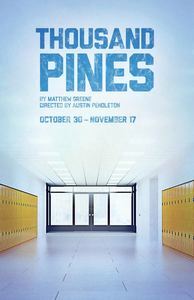 “Thousand Pines” is a story of common humanity, healing, and forgiveness in the wake of a shooting at Thousand Pines Junior High School. As three families gather months later, on Thanksgiving Day, they are united in their grief and determination to move forward. The play contains mature themes and language. A panel discussion on “Art and Gun Violence” will feature Matthew Greene, “Thousand Pines” playwright; Mary Himes, #UNLOAD co-founder and executive director; and Helen Klisser During, #UNLOAD co-founder and artistic director; moderated by Bethany Gugliemino, WCP artistic and management associate, on Monday, October 29, in the Playhouse’s Lucille Lortel White Barn Center. Doors open at 6:30 p.m. The panel discussion begins at 7 p.m.
A discussion with Linda Rost, trauma expert and co-coordinator of the Fairfield County Trauma Recovery Network, is set for Friday, November 2 at 6:30 p.m. in the Playhouse’s Lucille Lortel White Barn Center. Sujata Gadkar-Wilcox, associate professor of legal studies at Quinnipiac University, will be interviewed by Michael Barker, Playhouse managing director, on the constitutional context of gun laws in the U.S. and internationally, on Wednesday, November 14 at 6:30 p.m. in the Playhouse’s Lucille Lortel White Barn Center. For information on all “Thousand Pines” special events, visit westportplayhouse.org/ThousandPinesEvents or call the box office at (203) 227-4177.